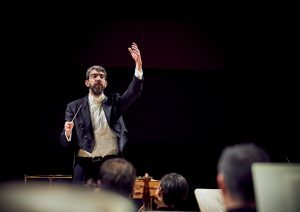 José Antonio Montaño with La Madrileña Orchestra at the National Music Auditorium of Madrid | José Antonio Montaño, Orchestra Conductor José Antonio Montaño, conductor. Maestro José Antonio Montaño and La Madrileña period instrument orchestra will be present at the Symphonic Hall of the National Music Auditorium of Madrid in the season 18-19. The programme includes the W. A. Mozart’s 41st symphony (Jupiter), the Spanish Vicente Martín y Soler´s overtures La capricciosa corretta and L’arbore di Diana and the Cello Concerto Nº 1 in C major by Joseph Haydn with Catherine Jones as soloist. The event will take place on February 23, 2019 (7:30 p.m.) at the National Music Auditorium of Madrid. José Antonio Montaño cover of the prestigious music magazine Melómano in April 2019.